Speeding or driving too fast is a common cause of auto injury accidents. Not only does driving at an increased speed take longer to stop the vehicle, coming to complete stop requires more distance on the road and makes the vehicle harder to control. When motorists choose to accelerate beyond the speed limits, they jeopardize themselves and others who share the road with them. Rosenfeld Injury Lawyers LLC represents people injured in Chicago car accident cases caused by speeding drivers. Sec. 11-601. General speed restrictions. (a) No vehicle may be driven upon any highway of this State at a speed which is greater than is reasonable and proper with regard to traffic conditions and the use of the highway, or endangers the safety of any person or property. The fact that the speed of a vehicle does not exceed the applicable maximum speed limit does not relieve the driver from the duty to decrease speed when approaching and crossing an intersection, approaching and going around a curve, when approaching a hill crest, when traveling upon any narrow or winding roadway, or when special hazard exists with respect to pedestrians or other traffic or by reason of weather or highway conditions. Speed must be decreased as may be necessary to avoid colliding with any person or vehicle on or entering the highway in compliance with legal requirements and the duty of all persons to use due care. 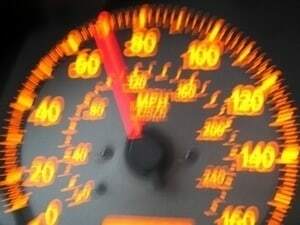 According to the Illinois State Police website, 32% of fatal auto accidents are caused by excessive speed or speed related. There also seems to be a correlation between speeding and alcohol consumption. In 2002, 41% of intoxicated driving fatalities were also speed-related versus only 14% of sober auto accident fatalities. On a national average, speeding is involved in more weekend and nighttime fatal motorist accidents than any other time of the day or week. By far, the highest demographic in fatalities involving driving too fast are younger drivers, especially males. Statistics reveal that males’ ages 15-24 years old were speeding in over 35% of all driving fatalities in 2008 in America. Older males between 35 and 44 years of age were speeding in 25% of all fatal accidents followed by 20% of males from 45 to 54 years old. Females of all ages are much less likely to cause speed-related fatalities than males of the same age. Not only does driving too fast contribute to 31% of all traffic crash fatalities, it also costs a bundle. The total economic cost in 2000 for speed-related crashes was estimated to be $230.6 billion in the U.S. However, the cost of compensating victims injured by someone driving too fast who caused an accident can be measured in money, pain, suffering and life-altering changes. If you are the victim of a vehicular injury accident involving a motorist who was driving too fast or speeding, you deserve to be financially compensated for your losses. At Rosenfeld Injury Lawyers LLC, we understand the law and how speeding can injure and endanger our clients hurt in a collision caused by a speeding car. We will fight aggressively on your behalf to obtain the financial damages you are entitled to for your injuries and other losses. We invite you to contact our Chicago car accident lawyers for a free consultation to discuss your case here. There is never any obligation and we only charge a fee after we have secured a financial award for you. How long do you have to file a lawsuit? Is auto insurance mandatory in Illinois? What is a medical lien? How much does it cost to hire a lawyer? Can I recover lost wages? Learn the in's and out's of your case from an experienced attorney who wrote the book on Car Accidents.